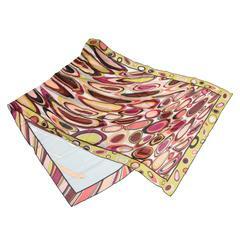 Pucci Baumwoll Schal Afrikanischer Aufdruck 1970er Jahre 35 "x 35"
Perfect to tie on a handbag or around your neck, this classic printed Pucci scarf from the early 2000s is in perfect condition. 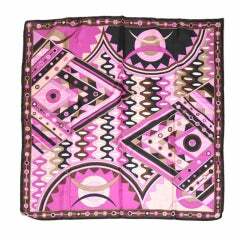 All over geometric print in pinks, purples and chartreuse with a touch of beige and black surrounded with a printed border. Signed 'Emilio' throughout. 16"x16"
Schöne Reihe von üppigen Farben bilden dieses Array dieses Pucci Schal. 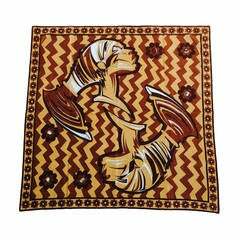 Emilio Pucci kühner abstrakter lila Dunst-Seidenschal misst 36 "x 36" mit handgerollten Rändern.